Jez Smith is one of those fighters that as soon as you watch once, you can’t help but get hooked. 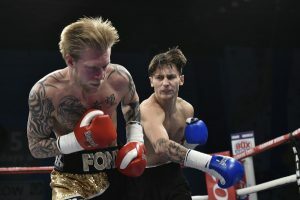 Light-footed and heavy-handed, the 24 year old welterweight is primed to make an impact on the division and he’s got his immediate mind set on taking on his fellow unbeaten prospects – Connor Benn just one name that he’s targeting – and his career has, arguably, been slow to kick off especially after his all-out brawl with Macaulay McGowan back in 2016 but Jez, as he says himself, has rebuilt and feels ready for those titles whenever they come a-knocking. Jez, great to speak to you, how did you first get into boxing? I just followed my brother’s footsteps more than anything, my brother got bullied at school and went down the gym and because we were always close I was just around it and started doing it, really enjoyed it and realised I was good at and here I am. Growing up with you and Mitch both boxing, was it always a good thing? Yeah it was alright because we bounced off each other, we were always quite competitive so we’ve always wanted to be better than the other and that definitely helped. At what point did you start considering boxing as a career? To be honest I was doing it for fun, with the amateurs and I was winning a few tournaments, I represented England but when I got to senior level about 18 or 19, I went in the Senior ABA twice and I wasn’t really training full-time, I got beat in both years so I sat down and spoke to my Dad – Mitch was pro at the time – and I said “I’ll either take this seriously or forget about boxing”, I was either going to go in the army or take it on professionally and I’m glad I didn’t choose the army, I’ll tell you that! Absolutely, how helpful was that amateur experience? I think it’s good to have that pedigree purely because you’ve been about the game for a longer time, you know how it works, you’ve learnt the basics and you’ve learnt about other fighters. Don’t get me wrong it’s completely different to being professional but it’s good to have the background purely because it’s just extra experience. Obviously we’re in the summer break from boxing, how do you stay busy? Are you still in the gym constantly? I try to keep in the gym as much as I can, it is difficult because I’m not promoted by a big promoter and I’ve got to sell tickets, get sponsorships, I do still have to work so if I’m not in the gym, I will always run, I will always stay fit and keep my weight at a good level. I don’t really blow up out of camp and go really heavy, I’m quite professional. You announced a sponsor today so how much does that help? Basically I’ve started working with Portobello PR who will be managing my exposure and will be managing my exposure and sponsors. They found that sponsor (BTR Podcast) and hopefully with them on board it will become a lot easier for me to train instead of working all the time. I’m under no illusions, I will still have to work but if it means I can cut down my hours then obviously that will help, it is difficult at this stage where I’m ready for the titles but I’m not earning enough to afford to be able to stop working. If you don’t mind me asking, what is your job? I’m doing plumbing at the moment. Is it easy to turn off from the boxing mind-set when you are plumbing then? I’m always focussed on my boxing whether I’m working or not because it’s always in my mind, I want to do it full time and make a career out of it but obviously I need to be able to keep focussed at work to earn a living but it is so difficult. Only people who are not full time professionals will really understand but I know my potential if I was full-time boxing as opposed to where I’m at now and I still think I’m at that level where I should be fighting for titles. Hopefully Mo (Prior) can provide the goods and get me a title shot for September. Talking of titles you were meant to fight for the Southern Area belt in June, how frustrating was it to hear that he’d pulled out? Very frustrating, very frustrating, I’ve been waiting for my shot for a while now and I’ve fought a fair few journeyman. I had a good fight with Macaulay McGowan two years ago in 2016 and he was unbeaten fighter and I thought I’d have got more recognition after that fight, on TV on one of Frank (Warren)’s small shows and I thought I would have got more from that fight after the draw because it was a cracking scrap but nothing came about so I had to go back to the drawing board and I’m where I am now so hopefully I can start fighting for titles. It was very frustrating with Louis Greene because I’d built back up to fighting for the Southern Area belt and he gave me that opportunity, he picked me as a voluntary defence and it was incredibly frustrating when I got the call because I was in good form, my weight was spot on, I’d got some good sparring and I was really looking forward to the fight. Are you at the point, now, where you’d rather fight less but in more meaningful bouts or keep busy until those big fights come along? That’s a tough one, to be fair, the thing is I wouldn’t mind being more active – I’d be very happy with that – but being on small hall shows you need to sell tickets and I’m at that stage where I’m not learning anything off these journeyman, they are just punch-bags. Not in a rude way but I would like better opponents so that the fans can see a better Jez Smith, fighting journeyman keeps me at the same level and you can’t see my full potential because, arguably, I drop down to their level at times. I wouldn’t mind being active but I’m happy to wait and stay focused, stay professional, stay fit, I can learn more in sparring than I do fighting journeyman. I actually remember watching your fight with McGowan, I thought you edged it, does it irritate you that you’ve not been able to kick on? Oh massively Ollie, after that fight I thought that even the rematch would have been good because I had stepped up in weight for that fight so I wasn’t at my weight but I thought Frank would have used me a bit more but I didn’t get anything back. I think things happen for a reason so it probably wasn’t my time but I believe, even though I had the hiccup with the Southern Area title, it is definitely my time now to kick on and start moving on. Are you set on the Southern Area for now or if something like the WBO European or one of those titles came up, would you take it? Listen, I’m a fighter, I’ll fight anyone and it doesn’t matter what route I go, I just want titles and I want to fight anyone who wants to fight and I’ll give it a good go. I’m not bothered what route, just get me the belts, get me in good fights with decent money. Are you next out in September on the British Warriors show? Yeah, September 29th at York Hall – what I’ve been told. You do bring a fair few fans with you, does that add any extra pressure? Nah not extra pressure, I like fighting in front of a lot of people and I’m only in small shows but I like having a lot of my fans there and, in general, a decent crowd because you get a good atmosphere and I thrive off that so I feel my performances get better as the crowd gets more excited. I look forward to when, one day, I’m in a big arena or somewhere like that. Would you prefer to fight in an electric small hall or a big arena but with a relatively small crowd? It don’t bother me as much, I want to be in the big shows and I’ll fight anywhere but it’s nice to be able to say that I’d have boxed at the O2, at Wembley because at the moment I’ve only been at York Hall, Camden and Harrow so I’ve only been on small shows so it would be nice to fight on a big card, in a big arena, but listen as long as I’m fighting in good fights, winning, I’m happy. Biggest learning fight – Macaulay McGowan? Without a doubt I learnt an awful lot from that fight, especially in being a professional, because like when I was a senior and I wasn’t taking it too seriously, this camp was probably the worst I’d ever had, I wasn’t eating the right food, I didn’t know what the right diet was and nothing was clicking. It was a massive wake-up call because I was stepping up in weight so I was just eating anything, not the right thing, so I’d put the weight on and if you’re driving a car, you wouldn’t put diesel in a petrol engine and that camp showed me it applies to boxing too, if you don’t diet right then you won’t perform even if you train to perfection. Against an unbeaten fighter we both wanted it but I faded quite quickly although that proved to me and a lot of people that I could dig deep and against the journeyman beforehand it’s always hard to gauge where you’re actually at – even though you might think you know – so against an unbeaten fighter you can measure yourself up and it showed me I had it, I ticked a few boxes, I got a lot of heart, I can fight and I can dig deep. I know it was a draw but did it, in a way, feel better than one of those wins against journeyman because of how much you learned? Yeah I guess so, to be fair, gutted as I was that it was a draw I’ve got to think “it wasn’t a loss” and I haven’t lost yet. I took a lot from it, if I won I probably wouldn’t have taken as much as if it was a draw because I wouldn’t have changed anything and I wouldn’t have learnt so later on in my career I could have got caught out and I’m proving that now. If you don’t mind I want to talk to you about Conor Benn, you were meant to fight Cedrick Peynaud, right? The plan was, my manager asked his manager for the fight, and I got told he was up for it and a few days later I got called saying he didn’t want it anymore and I’m guessing he probably got paid a lot more for the rematch with Conor. I could be wrong but I was told he got £8,000 for the first fight so make your own mind up but would you want a fight with Conor? It’s a fight I would love, Ollie, if I got a call now and said “do you want the fight?”, I would jump right in, I believe I’m better than him, I’m stronger him, a better all-round fighter and I’ve got no disrespect for him, he’s doing well for himself, fighting on big Matchroom cards, getting TV but I just think I’m better than him and I want to fight good British fighters, he’s one of them! And he’s a name, obviously, his dad was a hell of a fighter and it’s a fighter I really want and I think a lot of unbeaten Brits would want that fight. I want to see him step up a bit, too, that Peynaud fight, he should have beaten him comprehensively the first time round and if I’m hitting with the shots that Peynaud hit him with then he’s not getting back up. There’s levels and I think I’m levels above him. How much does being mentally strong impact on fight night? Hugely, even when you’re in camp, doing the weight, training, mentally you’ve got to be strong to stay committed to eat properly, cut the weight. 100% important. Do you find making weight easy? I don’t find it too bad, I do it properly so I give myself eight weeks and I eat clean, I don’t cut massively and I do 10st 7lbs, 147lbs, quite easy. Good enough without being crazy. Is there potential for you to go up a weight division in your career? There was actually talk of me moving down so I don’t know about moving up because I hold my power and speed at welter so it’s definitely a possibility in the future but I’m very happy for now. I want to test myself first before making that decision, I think I’m at a good category for now. In one year, in terms of titles, where would you like to be? I’d like to be knocking on the door of British title, I just want to fight the best and whoever is in front of me and holding the titles then I’ll have to fight them. I know you’re young so I don’t want to get you to think about retirement just yet but when you do hang up the gloves would you want to stay in the game? No doubt, 100%, I’d like to start training people myself, I’d like to pick up a fair bit of knowledge whilst I’m fighting and you never stop learning so why not pass it on to some young kids in the game, I’d love that. I’ll end on something random mate, if you were a crisp what flavour would you be? Bloody hell… prawn cocktail, I reckon. SMOKY BACON? Nah, prawn cocktail because it’s my favourite because it’s my favourite, come up with a fancy reason for me Ollie when you write it. Pressure’s on now for me to come up with a fancy reason, let’s just say it’s because Jez is sizzling in the ring… a bit like prawn cocktails if you get them on your lips for too long! In all seriousness though it was an absolute pleasure to speak to Jez and I’ve got no doubt he’s on his way to big things in this industry so jump on the bandwagon now because it’s going to be one hell of a ride.